Cleveland Indians first baseman Nick Swisher (33) celebrates with center fielder Michael Bourn (24) after both scoring against the Oakland Athletics during the ninth inning at O.co Coliseum. The Cleveland Indians defeated the Oakland Athletics 7-1. 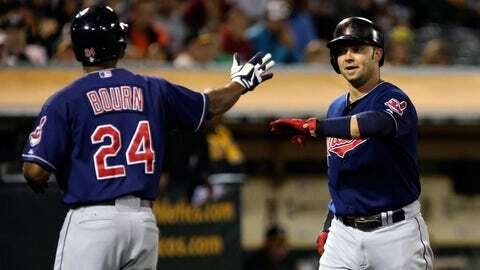 Cleveland, OH — The Cleveland Indians announced on Tuesday that Nick Swisher and Michael Bourn have been added to the player lineup for this year’s Tribe Fest, presented by KeyBank, set for Progressive Field on January 25 and 26. Swisher and Bourn join manager Terry Francona, Michael Brantley, Mike Aviles, Carlos Santana, Danny Salazar, Ryan Raburn, Yan Gomes, Corey Kluber, Zach McAllister, David Murphy, Trevor Bauer and other current roster players scheduled to appear at the event. Admission for adults is $10 in advance and tickets are available NOW at Indians.com/TribeFest. Kids ages 12 and under again this year can attend the event for FREE when reserved with the purchase of an adult ticket. There is a limit of two free children’s admissions per paying adult. Tickets for kids age 12 and under are $5 at the gate day of event. **All player appearances are subject to change. For complete event details, visit Indians.com/TribeFest.